Antibiotics have been used in animal feed for about 50 years ever since the discovery not only as an anti-microbial agent, but also as a growth-promoting agent and improvement in performance. Tetracyclines, penicillin, streptomycin and bactrican soon began to be common additives in feed for livestock and poultry. Currently, the following antibiotics are used in livestock and poultry feed: chlortetracycline, procaine penicillin, oxytetracycline, tylosin, bacitracin, neomycin sulfate, streptomycin, erythromycin, linomycin, oleandomycin, virginamycin, and bambermycins. In addition to these antibiotics, which are of microbial origin, there are other chemically synthesized antimicrobial agents that are also sometimes used in animal feeds. These include three major classes of compounds: arsenical, nito-furan, and sulfa compounds. Arsenical compounds include arsanilic acid, 3-nitro-4-hydroxy phenylarsonic acid, and sodium arsanilate; nitro-furan compounds include furazolidone and nitro-furazone; sulfamethazine, sulfathiazole, and sulfaquinoxaline. Other chemicals are also used as antiprotozoal agents to prevent coccidiosis and histomaniasis in chickens and turkeys. Antibiotics are used regularly in animal feed at a rate of 2 to 50 grams per ton for improved performance in the animals. The reasons include a more efficient conversion of feed to animal products, an increased growth rate and a lower morbidity/mortality rate in general. The levels of antibiotics are often increased to 50-200 grams/ton or more when specific diseases are being targeted as when the spread of a particular disease is rampant. The levels are also increased in times of stress. This increased amount is often decreased when the threat of a disease is gone. The benefits of antibiotics in animal feed include increasing efficiency and growth rate, treating clinically sick animals and preventing or reducing the incidence of infectious disease. By far the major use of antibiotics among these, however, is increased efficiency, i.e. a more efficient conversion of feed to animal products, and an improved growth rate. In chicken feed, for example, tetracycline and penicillin show substantial improvement in egg production, feed efficiency and hatchability, but no significant effect on mortality. Chlorotetracycline, oxytetracyclin and penicillin also show an improved growth rate, but little effect on mortality. Antibiotics in animal feed, in general, are used regularly for increased efficiency and growth rate than to combat specific diseases. After animals have been fed antibiotics over a period of time, they retain the strains of bacteria which are resistant to antibiotics. These bacteria proliferate in the animal. Through interaction, the resistant bacteria are transmitted to the other animals, thus forming a colonization of antibiotic resistant bacteria. The bacteria flourish in the intestinal flora of the animal, as well as, in the muscle. As a result, the feces of the animal often contain the resistant bacteria. 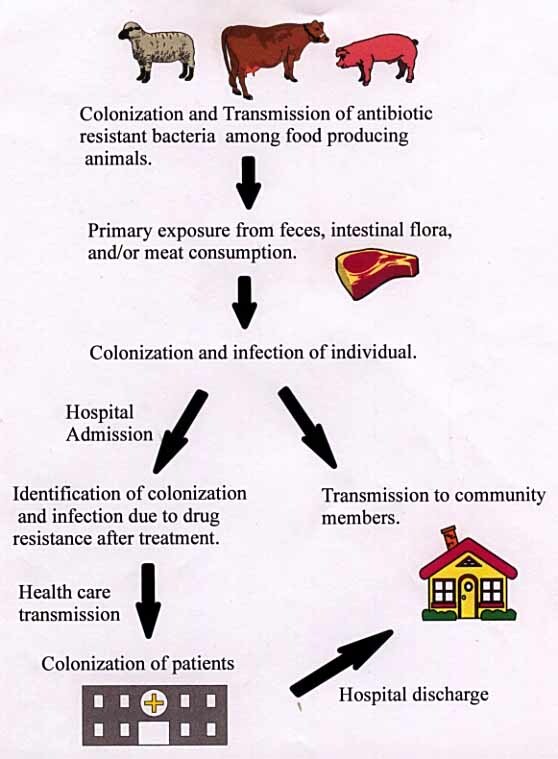 Transfer of the bacteria from animal to human is possible through many practices. The primary exposure of humans to resistant bacteria occurs in farms and slaughterhouses. Humans clean the feces, which contain the bacteria, of the animals on farms. During the cleaning process, humans may get bacteria on their body and hands. If the body or hands are not properly cleaned, the bacteria could be ingested by the person. Likewise, in slaughterhouses, during slaughter, the intestine is severed. Resistant bacteria are exposed to slaughterhouse workers, which could get the bacteria on their bodies and hands. Transmission occurs when the bacteria is ingested. Along with the previous sources of contamination, humans can get infected by eating meat from animals with resistant bacteria. Even though cooking reduces the survival of the bacteria, some may still survive and infect the human. For example, 1983, 18 people in four midwestern states developed multi-drug resistant Salmonella food poisoning after eating beef from cows fed antibiotics (1). After initial transmission and infection to humans, the transmission to other humans has a couple paths. Transmission can take place through the many mediums (aerosol, physical contact, and bodily fluids) of human contact in the community. An infected individual may also be admitted to a hospital for treatment. Treatment may not work in drug resistant bacteria, therefore, identifying a drug resistant infection. Bacteria is transmitted to other patients via the hospital environment or health care worker=s hands. After transmission, the bacteria will colonize in several of the patients. Colonization in other patients with other resistant bacteria can produce bacteria with multi-drug resistance. Once the patients recover, they are discharged into the community. These patients could potentially infect several community members. Multiple infection could potentially produce a supergerm which is resistant to many drugs due to resistance sharing between bacteria. In most cases, the drug resistance genes of bacteria are carried on plasmids (specifically, the R or resistance plasmid), which replicate separately from the cell’s circular DNA. These plasmids can be passed from cell to cell, allowing for a drug resistance to be passed to a large group of bacteria and to different types of bacteria. These resistance genes are also carried on transposons, which allow for these genes to move from one strand of genetic material to another. Because of this, a cell can receive multiple plasmids with resistance genes and then integrate all of the resistances onto one plasmid. Some R plasmids have as many as 8 drug resistances on them. The development of a drug resistance is not orchestrated specifically to counteract a drug. Rather, drug resistances arise because of spontaneous genetic mutations within a gene sequence. By chance, these mutations happen to produce some change in the cell that allows for drug resistance. This mutated bacteria then has a selective advantage over other non-resistant bacteria. The addition of antibiotics to the environment (the host organism) then selects for the resistant bacteria by killing off all of the non-resistant bacteria. This allows for the resistant cells to grow and divide, creating a large population of resistant bacteria. The larger population then increases the likelihood that plasmid transfer will occur to other, non-resistant bacteria of various strains. This attained resistance has little effects on the host organism until plasmid/resistance transfer to a particularly virulent bacteria occurs. Then, the host is susceptible to infection from this organism without the benefit of treatment with the antibiotic that the bacteria is now resistant to. 4. Active transport - the transport of drug molecules out of the cell. In many cases, this is done via a drug/proton antiport system. With this mechanism, H+ ions are pumped into the cell as drug molecules are pumped out. 5. Enzyme or pathway alteration - the cell can change the pathway or enzyme used to carry out a cell process occurs. By doing this, the cell can bypass the enzyme that is affected and cause the drugs effects to have no bearing on the functioning of the cell. 2. Transformation - the absorption of "naked", free-floating DNA by a cell. Upon the death of a bacterial cell the cell components degrade, leaving the DNA and cell materials to disperse in the environment. If a cell with antibiotic resistance dies and breaks down, the resistance gene may be released into the environment and absorbed by another bacterial cell. 3. Transduction - the transportation of genetic material by a bacteriophage. When a bacteriophage infects and replicates in a cell, some new phages may be filled with cellular genetic material, rather than viral genetic material. In some cases, this cellular material is a resistance gene. When the phage containing the resistance gene infects another cell, the infected cell then gains the bacterial resistance. The economic impact is difficult to measure, partly because extensive searching could not turn up exact figures for employees and profits specifically in feed additives. However, it is safe to say that in the U.S. alone, stopping the practice of adding antibiotics would result in a loss of millions of dollars in profits and thousands of lost jobs. It is also worth noting that sales of antibiotics are a very profitable sector for companies that engage in their productions. Antibiotics in Animal Feed, Council for Agricultural Science and Technology, 1981. McDonald, L. Clifford, Matthew J. Kuehnert, Fred C. Tenover, and William R. Jarvis (1997). "Vancomycin-Resistant Enterococci Outside the Health-Care Setting: Prevalence, Sources, and Public Health Implications" Centers of Disease Control and Prevention, Alanta, Georgia, 3. "The Rise of Antibiotic-Resistant Infections" (1995). FDA Consumer, 29.